The former honduran congressman is accused of importing “multi-ton loads of cocaine” into the United States for more than a decade. A brother of Honduran President Juan Orlando Hernández was charged by federal prosecutors in New York on Monday with being “a large-scale drug trafficker” who conspired to bring tons of cocaine into the country between 2004 and 2016..
Juan Antonio “Tony” Hernández appeared in court in Miami on Monday three days after his arrest at Miami airport. The indictment, first obtained by Insight Crime, accuses the 40-year-old former Honduran congressman of importing packages of cocaine stamped with his initials and protecting "multi-ton loads" of cocaine shipments by paying bribes to local officials and arranging for "machine-gun toting security", including Honduran police. Hernández was also charged with weapons related offenses involving the use and possession of machineguns and "destructive devices", and making false statements to federal agents. . If convicted, he faces possible life in prison. "Hernández and his criminal associates allegedly conspired with some of the world's most deadly and dangerous transnational criminal networks in Mexico and Colombia to flood American streets with deadly drugs," said Special Agent in Charge Raymond Donovan in a statement. The arrest comes less than a year after Devis Leonel Rivera Maradiaga, a former leader of the once powerful “Cachiros” criminal group, testified that he paid bribes to Hernández. The indictment described a video of a meeting in 2014 in Honduras where Hernández agreed to help Rivera Maradiaga by arranging for Honduran government entities to pay money owed to Cachiros money-laundering front companies in exchange for kickback payments. Rivera Maradiaga paid Hernández approximately $50,000 during the meeting, according to the indictment. Univision Investiga last year reported how a Honduran army captain was fired after he accused Tony Hernández of ties to a helicopter seized in a drug raid. 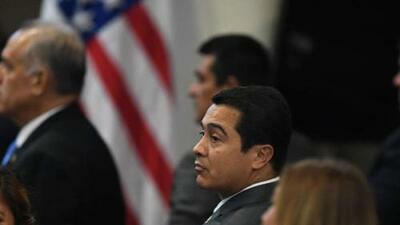 President Hernández said his brothers' arrest was "a heavy blow for the family. But he added that “no one is above the law,” and he hoped that "the justice system will be able to shed light on whether those allegations are true or not." He also said that his government remained committed to the fight against drug trafficking and corruption. President Hernández, 50, first took office in January 2014 and was narrowly re-elected a year ago in a disputed election during which more than 20 people were killed in protests over alleged vote fraud. Honduras' ruling National Party has been hit with a series of drug scandals. In September 2017, US authorities sentenced Fabio Lobo, the son of former President Porfirio Lobo, to 24 years in jail for conspiring with the Cachiros to smuggle into the United States.